The mystery of an erupting star may be explained by the realisation that it has been engulfing planets. Last year, the usually well behaved star V838 Monocerotis dramatically brightened three times, and astronomers were at a loss to explain why. The latest suggestion is that the expanding red-giant star was swallowing three gas planets that were orbiting it. Astronomers are looking carefully at the observations as what happened to those planets may one day also happen to the Earth. V838 Monocerotis is located about 20,000 light-years away in the constellation Monoceros (the Unicorn). The outbursts were detected last year by Australian amateur astronomer Nicholas Brown. The star was seen to brighten to more than 600,000 times our Sun's luminosity. Astronomers had previously been unable to explain what transformed a dim star into the brightest, cool, supergiant star in the Milky Way. The Hubble Space Telescope's Advanced Camera for Surveys had earlier recorded a dramatic image detecting a burst of light spreading into space and reflecting off shells of dust around the troubled star. Now, in research soon to be published in the journal Monthly Notices of the Royal Astronomical Society, Dr Alon Retter and Dr Ariel Marom, from Sydney University, suggest the activity can be explained by the expanding star swallowing nearby planets. 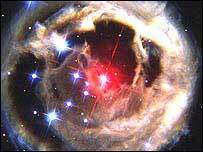 The researchers say that V838 Monocerotis flared because it was fuelled as it engulfed three orbiting planets. It could be the first evidence for an event that had been predicted but not knowingly observed. Support for this assessment, say the astronomers, is provided by the study of the shape of the light curve and comparison between the observed properties of the star and several theoretical studies. In addition to the gravitational energy generated by the process, there may also have been a rapid release of nuclear energy as fresh hydrogen was driven into the hydrogen-burning region of the star. Some researchers believe that planet swallowing may be common and may explain why so many stars have enhanced levels of metals in their surface regions. The metals may have come from engulfed planets.